While the majority of us would be happy with a standard M3, Hamann's apparently not as satisfied as the German tuning shop has just revealed a couple of serious tuning packages for the V8-powered E92 BMW M3 Coupe. The two blend all sorts of fun performance upgrades with enough cosmetics to make Mary Kay blush. The first tuning package increases the 4.0-liter V8's output to 435 HP and a slight boost to torque on the crank shaft. 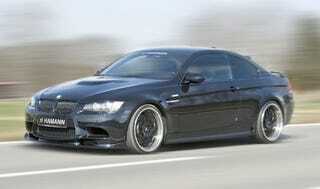 With the removal of the speed limiter, the M3 can go up to a top speed of 187 mph. The second kit called "Sportkit HM/M +35" raises output to 455 HP. This second package pushes the speedometer up to a speedgasmic 199 mph. As far as looks go, Hamann drops a black on black paint job, matching the rims to the dark-as-night skin. Gorgeous. The black knight certainly does return.